The current work is a treasure of information. Dr. Varma and Dr. R. Valavan make available all recent proving information of the Central Council for Research in Homoeopathy, of which Dr. Varma was the Founding Director. Many know about these provings, but they were difficult to find. In addition, Dr. Varma and the team has scanned the recent provings since 1985 and offers new proving information from many countries in Dr. Varma's known style. I can say his known style as I am familiar with another work of his: "Encyclopaedia of Homoeopathic Pharmacopoeia". When I prepare my materia medica teaching, it is one of the works I often check to know about the substance and its preparation. 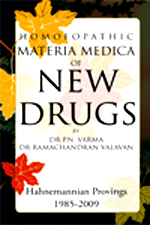 The scientific mind of the authors deliver the precision which the reader expects and the same can be said about the Materia Medica of New Drugs. So I am happy to read a clean schema per remedy, with symptoms per chapter which offers a quick and organized reference to the information. In the beginning of each Materia Medica text, there is a precise reference to the author and the source. As one can expect, followed by an explanation about the preparation and, if applicable, some more details about the proving or the clinical verification. A wonderful organisation of most interesting proving information altogether!